Rocky is in the final of the Eukanuba World Challenge! It has been a wonderful time hera in Long Beach. Eukanuba has really trated us well. We dont need to lift a finger!!! They had grooming rooms with dryers and blasters and grooming tables at the hotel. At the show there is a grooming place for the “World Challenge” with blasters and stand dryers as well as tables. Very well organised. 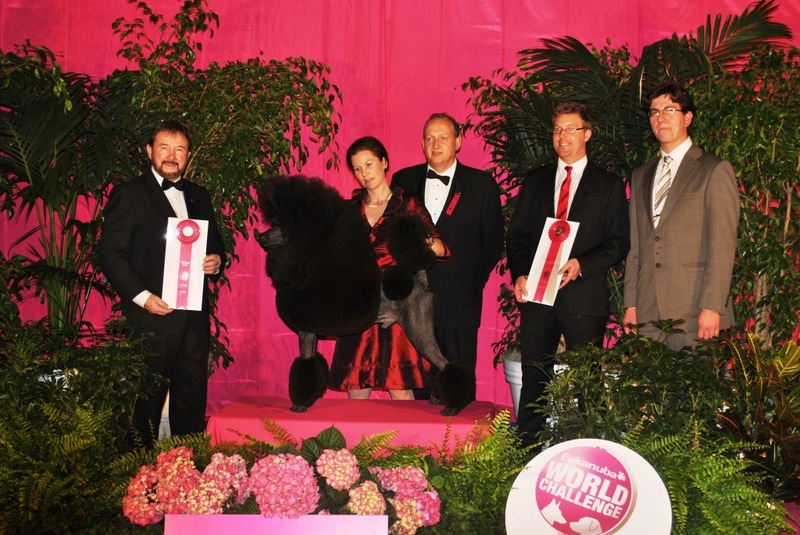 Saturday it was the semifinal of the Eukanuba World Challenge and also the Poodles at the National. Mr Sean Delmar judged our group/section and Rocky got to the final, as well at the Smash Poodle from Singapore and the Pug from the Phillipines. My favourite was the Doberman from Argentina. I did the trimming of Rocky and Rachel helped me to do his topknot. He looked great!!! Thank you! “Thomas” Ch. Dacun Kaylens He´s A Heartbreaker got BOS at the National to the female, Ch. Brighton Encore. We had a great time at the show and spend a lot of time talking to people and did some shopping. Really relaxed. Rocky was bathed already on Thursday, I gave him his haircut on Friday and on Saturday it was only the topknot and the finish to do. For the ones that havent been shown in the US before its quite different to Scandinavia or Europe. You have a very little time to show your dog, only a couple of minutes and you have to keep the dog in control. At home we want them to show them off a bit more than in the US, I do anyway. But here there is no time. Just try to keep your dog in control and move as good as he can. 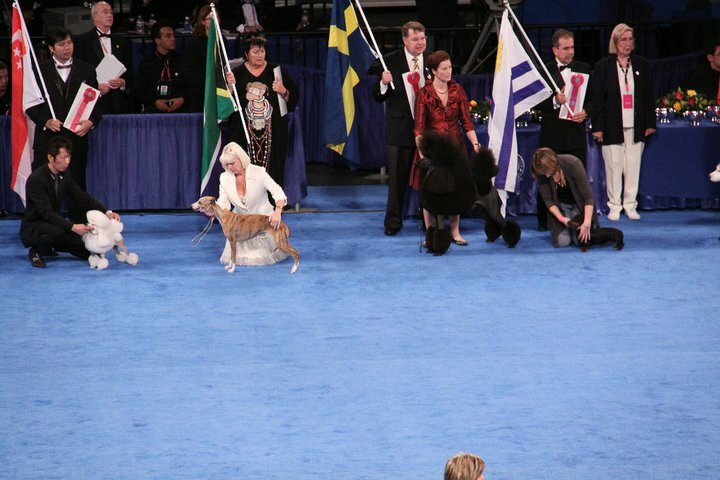 In the ceremony of the Eukanuba World Challenge all countries entered with the flag of the country and the dog representing the country. Mr Dan Ericsson took the flag for us. It was great to see the whole ring full of flags and dogs!! After the show we got a car back to the hotel to give Rocky a rest and some food, actually I had to bath his topknot before leaving the show. Some people said I didtn look happy, just focused to give Rocky a bath, but this is the life with a Poodle. I wanted this to be done so Rocky could rest before the final on Sunday and not need to spend the whole day on the grooming table. We were happy and we still are. In the final we have Mrs Carla Molinari from Portugal. We are just happy to be there and show Rocky once for the public. Rocky showed great and he loved every minute there. He ended up as Runner Up BIS!!! That is the same as BIS-2!!! The beautiful brown Doberman from Argentina got BIS!!! I couldnt do a better choice for that, he was absolutely stunning! So sound and great built with a great movement on a loose lead! Congratulations! Thanks also to the Eukanuba Team for the great time and hospitality!!! It was the trip of our life!!!! Back home to reality!! !Preparing dogs for Helsinki show and rest for the BIG SWEDISH CHALLENGE!!! Stockholm Show!! !